Easter comes, and a chocolate Easter egg comes almost automatically. I’ve always given it for granted, though in these last two years I revaluated the old habit of buying a good chocolate Easter egg for Claudia and Tommaso. I also had the surprise to start receiving one again. My inner child screamed with joy. Chocolate is a gift that makes me easily happy, as well as a bottle of good extra virgin olive oil, homemade jams, marmalades and preserves, not to mention a bunch of herbs or a smelly cheese. This year, however, I saw the usual chocolate Easter egg under a different light. Just a few days before Easter we had a visit from far far away: we opened out house to two girls from Singapore, Claudia’s friends, whom she met in Stuttgart when she was there in Erasmus. They met again after four years. We all gathered quite naturally in the kitchen for a cultural and gastronomic exchange. They cooked rice and chicken on the first night and a black pepper broth with boiled pork ribs on the second. This sounded a bit weird to us, used to roast our pork ribs on coals, but mum went for a second serving, and this can be the best proof of how much we appreciated that dish. When our turn came, we cooked fresh pasta and on the last night I kneaded by hand four kilos of pizza dough, which rose slowly for about twenty-four hours and was then baked in our wood fired oven. We spent the evening before Easter in an old-fashioned mood: we sat around the table at eight and we got up only at midnight to go to sleep. We ate pizza with the whole family and a few friends, then we played cards and shortly before leaving we opened our Easter eggs. Usually we are the kind of people who open Christmas gifts and Easter eggs as first thing in the morning, still dressed in our pajamas, with bed hair and even before having a proper breakfast, but this year we granted an exception. We handed the egg to our guests, mimicking the clumsy movements we make when we try to open the chocolate egg with a knife, and they had fun, laughed, smiled at the surprise and helped us finishing all the dark chocolate, between a game and another at Uno. Our dinner gave me the right perspective to re-evaluate the chocolate Easter egg tradition. Yes, the chocolate egg is still especially reserved to children, but it’s a sweet reat that you can appreciate even as an adult, especially if you choose a good quality chocolate. 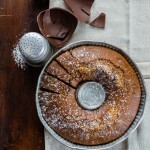 This year I managed to save some dark chocolate from the Easter egg – and I still have some in a glass jar in the kitchen – and I baked a Tuscan bundt cake with farro flour, mascarpone and dark chocolate, as simple cakes and breakfast loaves are still the most appreciated sweet treat in our house. 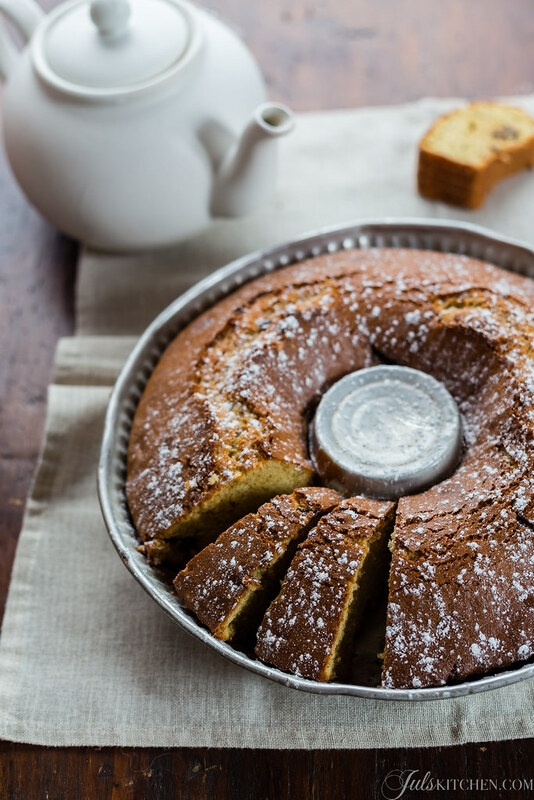 Mascarpone, as in this pound cake, keeps the crumb moist and compact, helping the cake to last for a week, just if you manage not to eat all the slices at once. Farro flour is now my choice more and more often. Not only it is better than wheat flour health-wise, it is also a typical Tuscan grain, cultivated in the Garfagnana area since the Roman time. 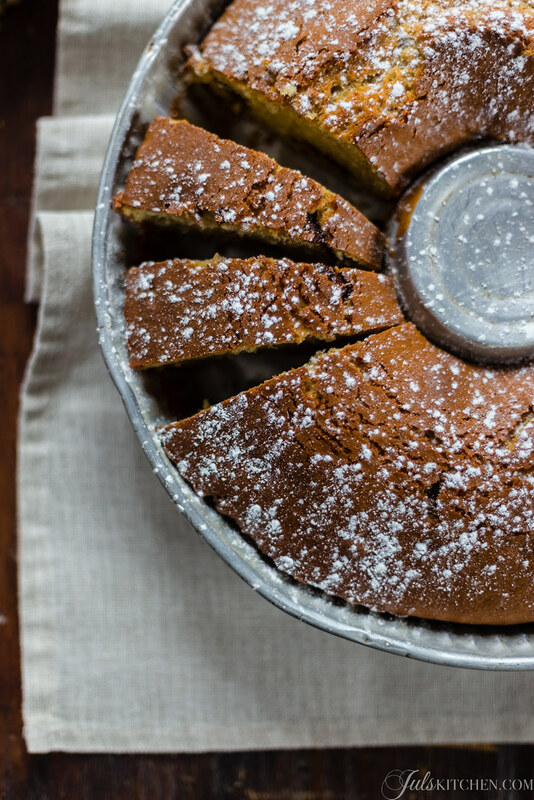 It is easy to bake with it and it will add a subtle nutty taste to all your baked goods, too. 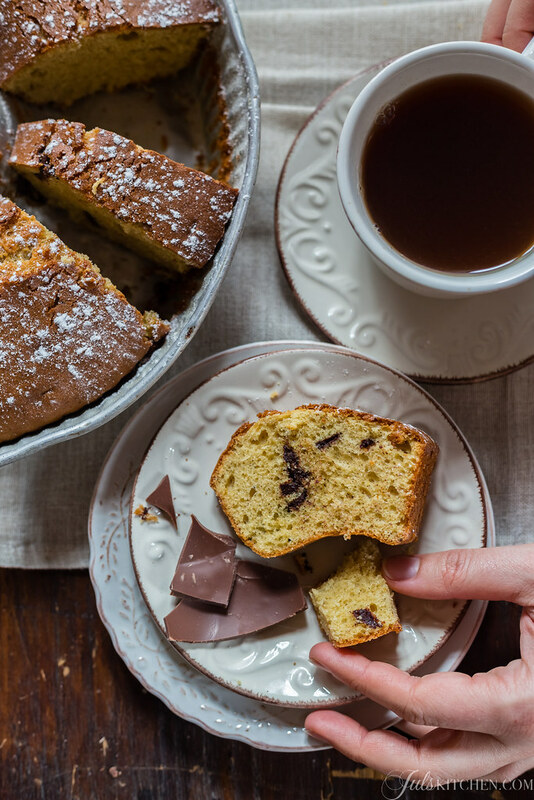 Dust with icing sugar, cut into thick slices and dunk the ciambellone in your favourite tea or coffee. Break the eggs into a bowl and beat them with cane sugar until they are light and foamy. Soften the mascarpone stirring it with a spoon, then add it to the beaten eggs, miking just enough to eliminate any lumps. Now add the orange zest and the vanilla seeds. Sift the farro flour with salt and baking powder and gently fold into the batter. At last add the coarsely chopped chocolate, stir, then put the batter in the fridge until the oven is hot. Heat oven to 180°C and grease with butter a ring mould, then sprinkle it with flour. When the oven is hot remove the batter from the fridge and scrape it into the mould. Bake for about 45 minutes, then remove from the oven and let it cool completely before sprinkling with some icing sugar. Slice into thick slices and enjoy. This is an interesting reading for the weekend, The Particular pleasures of British cookbooks. 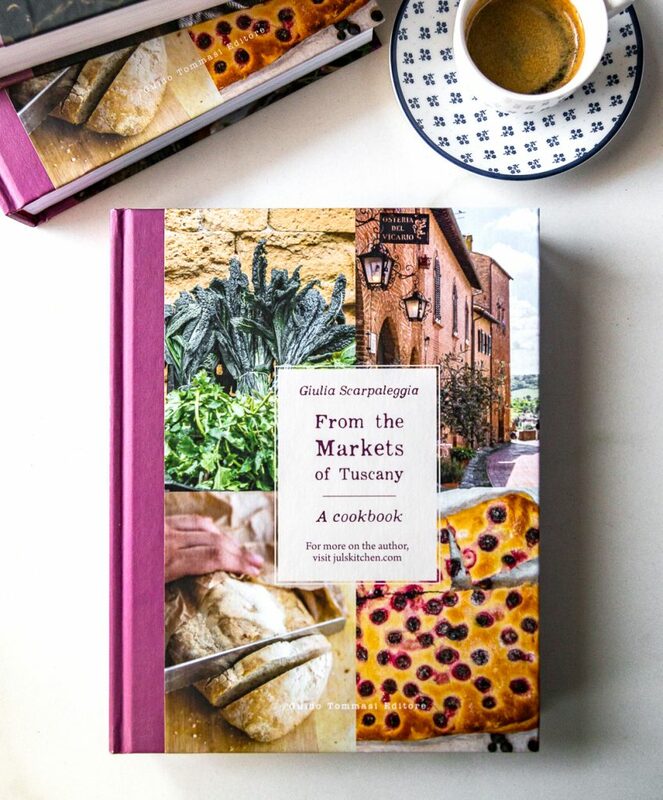 You know, I have a soft spot for anything with a British charm, from Colin Firth to English stout, but since I discovered Elizabeth David a few years ago, I realized that reading English food writers can even sooth my soul. So I share with pleasure this article with you. Check Valentina’s new post on Farro salad. You’ll discover many interesting facts about farro, its history and a tasty recipe is included, too. From the New York Times, seven simple rules for healthy eating: they may seem obvious, but I like the journalist’s approach. They are not “laws” and should not be treated as such. No specific nutrients will be demonized, and none will be held up as miracles. But these recommendations make sense to me, and they’ve helped me immensely. I finally bought the plane tickets so it’s official: this year I’ll attend the Oxford Symposium of Food, whose focus will be food and communication. It will be in July, but I am already counting down the days. Now tell me which is you favourite way of using leftover chocolate from your Easter egg, but also from an open chocolate bar. I am waiting for your ideas and recipes down in the comments! 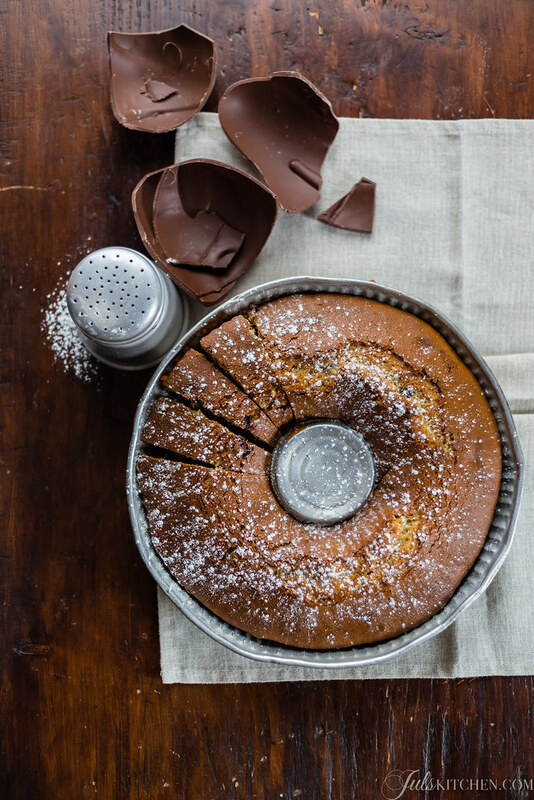 The Italian breakfast, spelt flour and cocoa ring cake. Guest post for Kulsum of Journey Kitchen I start with the breakfast. 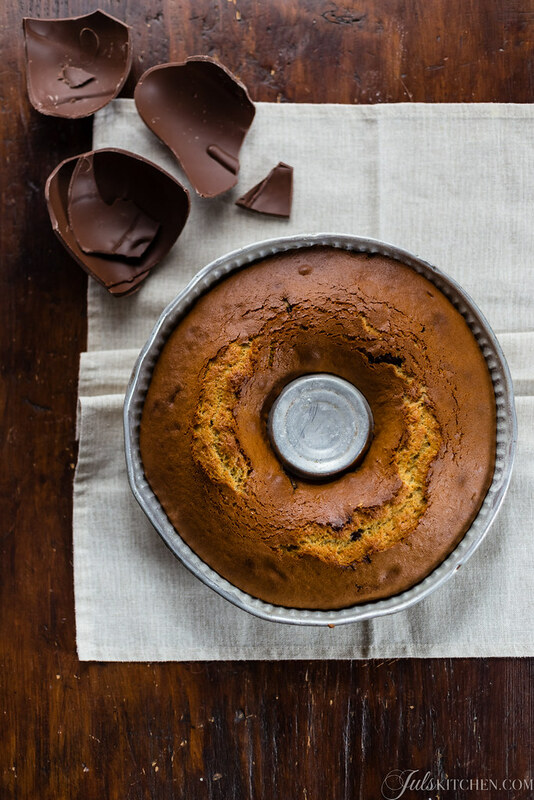 Butternut squash cake Bread pudding cake for breakfast Gluten free butternut squash bundt cake. Things you bake after a walk. I love using farro and I’m glad that it is quite easy to find in the US now, I have extra chocolate and I’m using it to make a phenomenal chocolate chip cookie with a nutella filling. Yummy!! The grandsons gave it their thumbs up approval. I will look forward to making this recipe. Grazie!! Hi Julia, this cake will be the perfect one for my daughter, but she cannot eat with gluten, do you know if I can substitute, the ‘Farro flour’ by one without gluten? I wll apreciate your answer. Ciao Lidia, I made yesterday a similar cake, without gluten! I used half rice flour and half potato starch, it should torn out great! Let me know if you try it!